aPM members are entitled to exclusive privileges & rewards (including discount & free gifts) by redeeming aPM Points accumulated via completing various tasks on aPetMart. How to earning aPM Points? There are multiple ways to earn aPM Points to be used on your next purchase. You will receive 500 aPM Points after your referred friend have signed up an account at aPetMart & successfully placed the first order. Your referred friend will receive 500 aPM Points sign-up bonus. How to redeem aPM Points? Every 100 aPM Points can be redeemed for a $1 discount. Please log into your aPM account first via My Account and place your order. 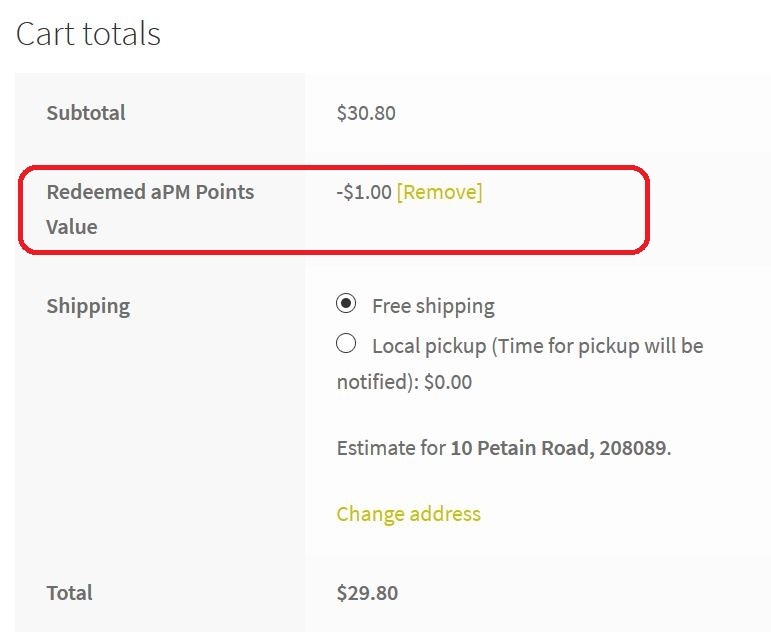 During checkout, enter the number of aPM points your want to redeem in the field below on your Cart page. Click “Redeem Now” button. The discount will be automatically applied. The maximum discount for each order that can be redeemed through aPM Points is 5%. How to check my aPM Points balance & transaction history? How does aPM Referral Reward work? Send friends your referral link (My Account > My aPM Rewards > My Referral Link). If your friend uses your referral link, you will receive 500 aPM Points after your referred friend have signed up an account at aPetMart & successfully placed the first order. Where to find my aPM Referral Link? Go to My Account > My aPM Rewards > My Referral Link. When do my aPM Points expire? Your aPM Points will expire 1 year from the time when the Points are earned. Exchange & return of goods is possible on a case-by-case basis within 3 working days of delivery, subject to aPetMart’s Terms & Conditions. Please check your orders upon receiving the delivery. If incorrect/defective items are delivered, please contact us immediately within 3 working days of delivery. All returned products should not be used or expired. Tags should not be tampered with and the item should be in the original box and/or packaging. Please ensure that the item you are returning is in the same condition as it was received by you and is packaged properly. Otherwise, the return or exchange is not valid. This policy is applicable only to those products that do not fall under the list of non-refundable items provided for on our Site. We regret that customers who decline to return the item to our fulfilment centre will not be eligible for any returns or refunds. We regret that currently we do not accept request for refund/exchange due to change of heart if the item is not incorrect or defective.